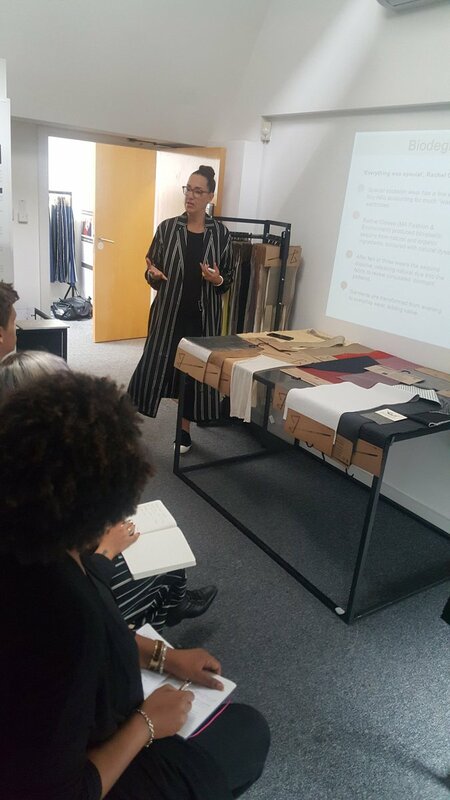 Last week we hosted the first group Future Fabrics Expo workshop at our studio in West London, following requests after hosting the 4th Future Fabrics Expo and seminar in September. The workshop proved to be an engaging and inspiring day for both the participants and for us. We opened the doors to a group of designers, buyers, fabric technologists and others from high street to high end brands, to explore our collection of over 1500 globally sourced materials with a reduced environmental impact, and to learn about the latest sustainable material innovations and global initiatives through presentations and activity based discussions. After looking at the current textiles landscape and the imperatives for improving working practices and impact in the textiles and fashion industries, we presented innovations from ground breaking new leather processing methods, to solvent free coatings, bio-based polyester, closed loop fibre processing, 3D printing and biodegradable sequins to name just a few. In addition, commercially available material opportunities presented ranged from bi-product fish leather to organic silk, recycled polyester and nylon, Tencel denim, luxury hemp, GOTS certified digital printing, bi-product oyster shell blends, plus many more natural and man made materials which meet our environmental sustainability criteria. These materials plus hundreds more fabrics selected from our collection can be found online at www.futurefabricsvirtualexpo.com. It was fantastic to see a common interest in reduced impact materials and production methods from such a range of companies, and especially interesting to see the variation in prior knowledge of sustainability. This really showed that it’s imperative that different departments and levels within companies join the dots and ensure all teams and areas of the company are on the same page when it comes to sustainability. If you are interested to participate in one of our future workshops or discuss a tailored workshop within your company, or if you would like to recommend materials, mills, brands or initiatives to include, then please contact us. In the meantime, you can keep an eye on our blog and newsletter for news, and visit the Future Fabrics Virtual Expo to discover and source sustainable materials.